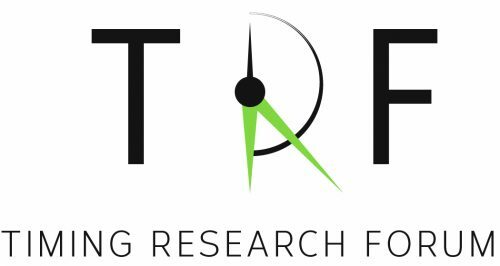 Timing Research Forum (TRF) is an open academic society for promoting multidisciplinary research on timing and time perception. Established in 2016 by Sundeep Teki and Argiro Vatakis, the aim of TRF is to bring together researchers with an interest in understanding time on a single platform and encourage open science and collaboration amongst its membership through organizing conferences, and sharing relevant information and resources. TRF will organize annual conferences that will be unique in their format and focus. The 1st Annual TRF Conference was held in Strasbourg, France from October 23-25, 2017. TRF2 will be held in October 2019 in Queretaro, Mexico. TRF conferences aim to be representative of the field and will cover all aspects of timing research and offer a platform for researchers who investigate time at several levels of understanding using a variety of techniques – from single cells to network-level understanding using neurophysiological recordings in animal models to behavioral, neuroimaging and neuro-stimulation approaches in humans during normal function and dysfunction in diseased states. TRF conferences will address topical questions on timing through research talks and poster presentations but also through open discussions where experts will be invited to offer their views that will inform the timing community of the current state-of-the-art. Thirdly, TRF conferences will actively promote the work of young scientists and make it easier for them to interact and network with senior investigators. TRF conferences will feature a PhD candidate as a Keynote Speaker who is selected by the TRF Committee on the basis of their recent published work. TRF has a strong focus on ‘open science’ and members are encouraged to share relevant resources like code, stimuli, data and offer advice and support with other researchers. We actively involve early career researchers in our mission who undertake responsibilities for various TRF activities like blogs, social media outreach and website support. We look forward to welcoming you to the vibrant timing research community!